I'm sure you put the cars together and the color will be different. Your wheel and wing combo pulls of this dark wing. I just sold everything you were talking about Phantom including an Alterkation front end a few months back and a set of 8x20 and 10x22 billet specialties wheels they were pictured in the first few pictures . Goodluck with your build sounds super cool. Blocked from Face blooked,,,book an a number of others here gave up or dont do face plant,,mean book!! Could you put some progress pix here for those non face people?? Thanks i sure want to see this awesum beast come to life.. DJ out west near DAne his last 2 are awesum Daytonas. Before I get emotionally invested in this car I have a serious question. Is this car a keeper and will it be driven? Seen too many of these become fantasy cars for sale with a $300k price tag. Dj i certainly will post all build pics I understand i am not on facebook either.Its slow going right now Dan Holohans shop has only been open for a few years since he left Rad Rides and Troy Trepanier and went to Detroit Speed for a few years then decided to open his own shop he has several projects in his shop including mine and unfortunately he cannot find Qualified help as of late and is doing all the work himself.My car is his first Complete Build from start to finish though so it will be huge for his shop and Dan himself never to worry with cars like Sickfish and Chicayne under his belt he is an under the radar badass car builder its just going to take a bit to get it built but that was alright with me since i Did not have a ton of money up front to have the car built we are on the five year or so plan. Homerr go ahead and get invested the plan with the Daytona is to Show the car for a few years then drive the hell out of it.Since this is the first full build from Holohans Hot rod shop i would like to travel to some shows and get Dan some accolades for his shop and skills first so it will be a trailer queen at first. love the long full tail lite,but not the big thing back up lite in middle?? 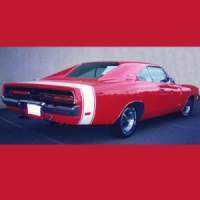 seems maybee color tint it or remove it ,an have red lence all the way.. or make a nice trim frame to cover part of it with charger or DAYTona emblem in the middle covering more of the back up lite? just my opinion,,total your awesum build ,so build your way an we will all enjoy it too..
Dj I like Suggestions always when we start finishing this car i am sure we will have new Ideas hell its already been 10 years with hundreds of changes and different parts. And to think i only wanted a Driver Daytona when i started. Love the build and not trying to mess with your design but why go with the 2008-2013 tail lights? Your build is top notch so why copy what people have been doing for the last few years? Why not go with the 2015-16 challenger tail lights, That hasn't been done yet as far as I know. I have been pondering that exact comment its very possible that could change from the rendering. My Chally is a 10, I like those tail lights better than the new ones. Just for input it comes up as a topic at the cruise ins that the earlier tail lights look like tail lights whereas 15-16 sorta have a cheaper look like plastic fascia stuck on them. May look great on yours but something to take another look at. Just a Few Things Happening with the Daytona Passenger side Quarter is Finished and we Changed things up a bit Decided to go with a 2016 Tail light package that will soon be Installed as well as a full custom made Chrome molly tube Chassis that im sure will be a work of Art. This is one serious build ! Can´t wait to see it finished. Yes and Fortunately you are the only people in the world that Know about it.Even the Builder wanted to keep it under wraps until it was finished. But me im so excited i had to show someone. great project, I love it. Just curious as to why the tube chassis in a pro touring ride? Isn't pro touring supposed to have nice comfy interiors and be more on the practical side? This will be a Pro touring style full frame with no pesky Bars to crawl around Dan Has some very one off things rolling around in his head for this Frame there will be no Cage but yet it will all be tied into everything. Im letting the Master Do his Thing. This build looks fantastic so far, I can't wait for some more updates. Thanks for taking us all along for the ride! Thank you Should be some real progress this winter right now its slow going. Thanks guys check this out never seen this done Dan Holohan is the Man wing Pedestal pockets. Interesting...i think I like it!